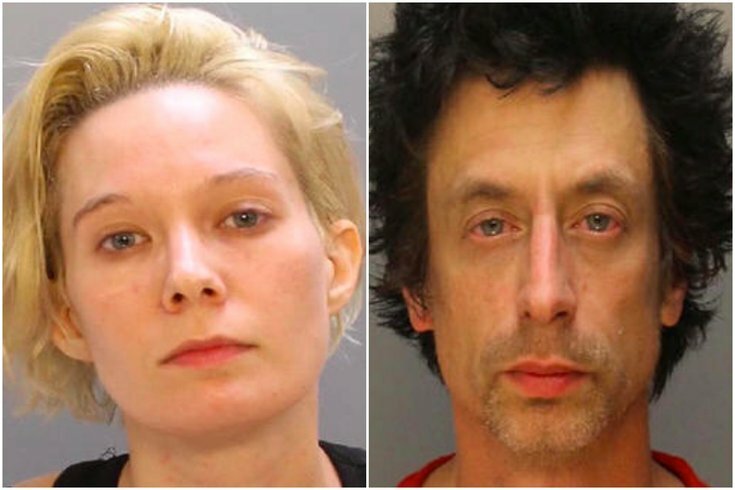 Patricia Monahan, 28, of Philadelphia, and Geoffrey Suchocki, 45, of Doylestown, Bucks County, were arrested by police and accused of vandalizing cars and buildings in the city's River Wards. A large group of vandals damaged luxury vehicles and newly developed buildings in Philadelphia's River Wards on Monday night, according to multiple media reports. They also left behind a banner that read "Gentrification is Death. Revolution is Life." Twenty cars and 10 new rental properties were damaged by a group of at least 20 people, police told CBSPhilly. They smashed windows and spray-painted messages with profanity. Damages are estimated at tens of thousands of dollars. Police arrested two people suspected of participating in the vandalism. Geoffrey Suchocki, 45, of Doylestown, Bucks County, and Patricia Monahan, 28, of Philadelphia, were charged with criminal mischief, conspiracy and causing and risking a catastrophe. The vandalism occurred around 9 p.m. in the area of Second and Jefferson streets, where the city's Kensington and Northern Liberties neighborhoods meet. Both neighborhoods, along with nearby Fishtown, have witnessed significant amounts of gentrification in the last 10 years. A police spokesperson told PhillyVoice that they would release more information soon. Amberlynn Kabana, a property manager of one of the damaged buildings, told NBC10 that the group targeted high-end vehicles, like Mercedes and BMWs. But the vandals also targeted newly developed properties, including each of her own. "They left us some messages that said that they weren't happy with our gentrification and they weren't happy with us building," Kabana told NBC10. "That was their overall intention from what I gather."